Jan 16, 2017 We regret the delays in completing your installation, and we understand your frustration. We would like to follow up with you to learn more about your experience, but unfortunately, we cannot locate your account with the information posted here. 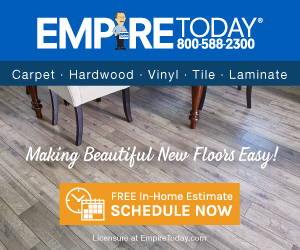 Please send your contact information to customersupport@empiretoday.com. Thank you. We have had THE WORST experience with Empire! They are horrid! Took 9 months of going back and forth with them to get them to actually finish an install that they had done completely incorrectly. They used the wrong material, they didn't bring enough material, they left mid job because it was time for the crew to get off...then they never came back; left the lobby of my business torn up, next crew that was supposed to fix it never showed up....followed by the next 3 crews. Finally got someone out, they didn't bring anything to fix the problem so they left and said proper materials would be ordered...they never were. This "material is being ordered" *** lasted for months. 9 months and dozens of phone calls later someone FINALLY finished the project. Review #789913 is a subjective opinion of User789913.